There is a direct correlation between installation torque and the capacity a helical can achieve. Therefore, it is imperative to accurately measure the torque values for each pier or anchor as it is installed. Even as a geotechnical report indicates the likely depth at which helicals will obtain capacity, borings are rarely taken at every pile location. 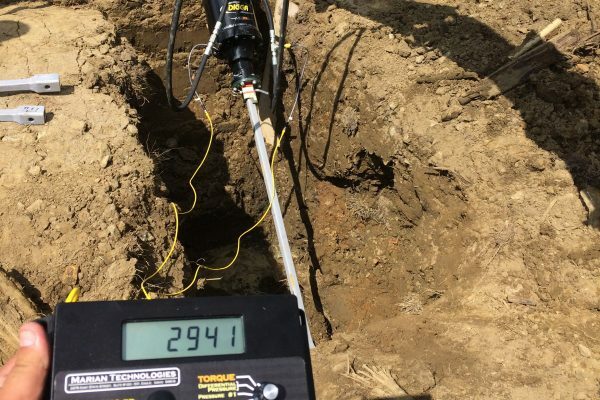 Torque logs provide in-field verification that helical piers and anchors have been installed to the depth necessary to achieve their ultimate capacity. As with other helical pile installation equipment, you want to select a torque indicator that is compatible with the type of work that you do. Popular torque indicators include a shear pin indicator, a differential pressure indicator, a digital torque indicator, and strain gauge technology; they can be synced with other devices through Bluetooth. A simple gauge indicating pounds per square inch can also be used along with a conversion chart indicating torque. Danbro sells a variety of torque indicators and will advise you on the best choice for you and your work. Helical piers and anchors react to the shear strength of the soil in the same way a metal screw reacts to the shear strength of the wood it is being screwed into. Screwing into a hardwood, like teak or oak, requires a lot of torque to penetrate the material. Similarly, helicals being screwed into high blow-count stiff soils will require higher torque values to penetrate. Over the 180 years of helical use, it has been proven empirically and confirmed through testing that there is a direct correlation between installation torque and ultimate capacity. In other words, the torque, or energy, required to advance the helical plates into the soil has a direct relationship to the actual capacity or load-bearing the helical can achieve. For example, with square shaft helicals, the ratio is 10:1. If you have registered 1,000 foot-pounds of torque on your measuring device, you have achieved 10,000 pounds. of capacity. Talk to a project expert. Danbro Distributors provides deep foundation products and the expertise, service, and support to install them. Office : 3700 South 26th Street, Philadelphia, PA 19145. Subscribe to our newsletter to get important news, expert insight, and inside scoops.